Domo arigato, sir. That looks great! Can that animation work for other skins (say, the red Genis-Vell)? No, Genis is just standing on the ground. I only did this animation today, and exported Genis before then. 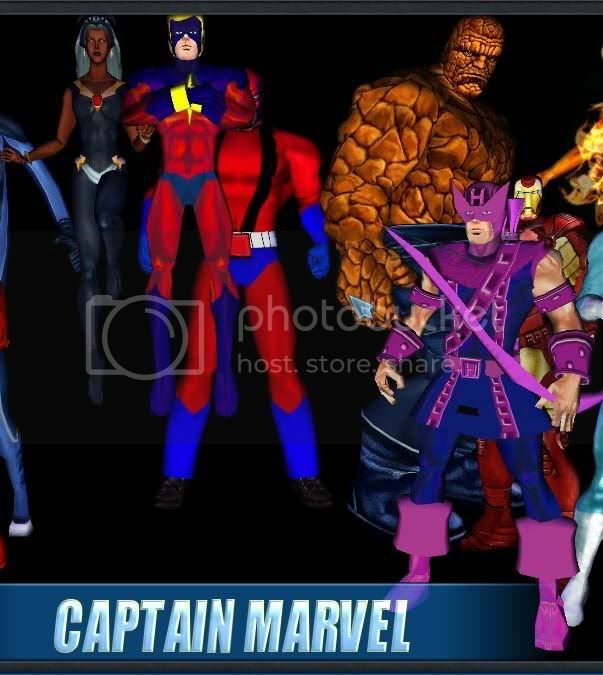 As the animation is built into the file, theres no way to swap it out, (other than to strip out the mar-vell skin, replace it with the genis one, and then you'd still have mar-vells hairstyle). I could re-export Genis with the new mannequin animation built in, but to be honest, I don't want to release twenty different versions of every mesh/skin, re-uploading everytime I make a change. As it is, I still would like to remake all my existing meshes/skins as and when I get bump mapping, mipmapping, reflect layers etc working. 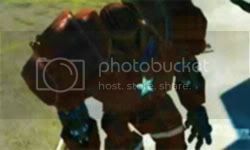 When that happens, remind me about adding the animation to genis, I hope it wont be too long till it does happen. Thanks TommyBoy, you're a gentleman and a scholar! Heres the fixed Hawkeye three pack, with no-blob skins, and bow and arrow that animate correctly and get put away and taken out at the right times. I'm pretty close to being able to release a Ronin mesh/skin too. I just have a few tweaks to make, with luck it may get uploaded later today. Merry xmas, happy hannukah, sensational solstice etc. And heres a Ronin 2pack, masked and unmasked. I think the weapons should work OK, but I haven't been able/bothered to get his/her/it's powers working correctly, so I can't be 100% sure. My Hawkeye shows all its powersets, fire and ice effects, power charging animations, and the arrow in the jump and grab finishers, but he still doesn't shoot any arrows and the finishers do zero damage (bad guys only fall back). What am I doing wrong or where in the forum are the instructions I'm missing right now? P.S. : I moved the "arrow.igb" (10kb) to models\effects\, and renamed it "hawkeye_arrow.igb", and still nothing. The finisher is the only thing that doesn't work for me, Tommy said he knows why. As for the arrow, just moving the one from models/weapons to models/effects (and renaming it, obviously) seems to have worked okay on my end. You got the packages for Hawkeye from the PSP-2-PC thread? Does the game show the missile model in his Xtreme? In Soviet Russia, the games mod YOU! If anyone needs any art for icons or portraits, feel free to ask, I'll see what I can do. Umm...no, I didn't, or at least if I did, I can't recall when, (and I was lying)..
And if the "finishers" are when you grab someone and do a "hard attack" (the one where Hawk gets an arrow and stabs them), that works for me, complete with damage (typically 16+2+2). I did notice a couple of times where it did no damage, and have no idea why, but if I had to guess, I'd go with the sort of flakey collision detection not uncommon in "3d" beat-em-ups (see "he was standing right in front of me and my ranged attack still missed" etc). (and note the arrow present on the "finishing" moves (though I have to rotate it)). Well, fic me. It doesn't do damage for me no matter how many times I try, which is kinda weird, huh? I'll look into both those (maybe the arrow finisher is 90% not working, and just now I got lucky when I went in game and tested it). I'll also check out the second ronin skin, as I'm not 100% sure I fully checked it out in game. If it's broke, I'lll fix it. And a Merry X-Mas to you too, man. Keep up the good work! Yeah, my dads from Yugoslavia, so he never gets too worked up about the "english" christmas or new year. I just went and checked the Ronin unmasked in game, no CTD for me. It's basically exactly the same as the other Ronin, but with the mask hidden, the head chopped off, and a female head and hair added, which is why its bigger, theres one extra map in there as well as a few wxtra polygons. And Hawkeye for me is getting the hit about 90-95% of the time with the finisher. I was using your old Hawkeye replaces wolvie herostat, so I'll just go try a "psp extraslots" herostat too, just in case it's one of those weird "not all powers translate somehow" deals. Yes please. I'm currently using the Hawkeye/Ronin herostat made by idrinkdrpepper. And I'll go check if the game will CTD or not if I put the unmasked mesh as the first Ronin skin. *shrugs* Anything can happen, right? EDIT: Yup, if I put it into the first slot, it won't crash. Interresting. Mayhap Ronin's slots are reordered, just like Iron Man's? EDIT2: Ayup, they are. Took a look in the herostat; she actually has 20703 used for the second skin and 20702 for the third one. Sheesh, they just love to confuse us further, don't they?